Nutrition is the process of making essential food substances (Nancy Nuwer Konstantinides). Nutrition is the sum of all interactions between organisms and the food consumed. (Cristian and Gregar 1985). In other words, nutrition is what humans eat, and how the body uses. Communities get food or essential nutrients for growth and defense of all body tissues and normalize the functioning of all body processes. Nutrients are organic and inorganic chemicals found in food and obtained for the use of body functions. Fruits and fruit ices can be made snacks and desserts are good. Fried chips and crackers are high in fat should be avoided. Exchangers are appropriate include melba toast, Ry Krips, graham crackers, bagels, English muufins and vegetables. Sherbert, angel food cake, fruit flavored gelatin, cookies like ginger snaps low-fat, newton cookies and sometimes frozen yogurt or low-fat ice milk is acceptable. Cakes, pies, cakes made ​​from egg whites, egg substitute, skim milk, and unsaturated oils can be used at all times. Avoid fried food, fried food, the fast food restaurant, choose from the salad bar or food is burned. Order a meal without a sauce, butter and sour cream. Use margarine instead of butter and use only small amounts. Ask for salad dressing is served in addition to and used in limited quantities. Avoid high-fat toppings such as bacon, egg slices, and cheese, eat a few sunflower seeds and olives. Comfort foods generally high in saturated fat or cholesterol. One way around this is to provide early casseroles, breads and desserts low fat, low cholesterol composition and freeze for an event when a short preparation time. Currently some manufacturers are making low-fat frozen foods, low in calories. 4. Foods high in fiber. Soluble fibers include pectin, gum and some hemicellulose are hypocholesterolemic agents. It's found in oat bran, bar ley, legumes and many fruits and vegetables. Soluble fiber that'' no'' as cellulose, found in wheat bran, has no such effect. Inclusion of dietary fiber is about 25-30g/hari desired. Appendix C provides a list of dietary fiber found in food. Recognize the need for permanent change and lifestyle to reduce risk. 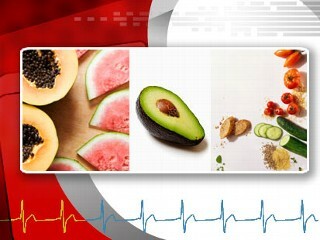 Reduce fat and cholesterol in the diet. Take steps to lower triglycerides (if possible). Achieve and maintain ideal weight. Provide enough food without increasing cardiac work. Lose weight if the person is too fat. Lowering LDL cholesterol levels below 130 mg / dl and total cholesterol levels below 200 mg / dl. Changing the type and dietary fat intake. Lowering the intake of dietary cholesterol. Increase intake of complex carbohydrates and lower intake of simple carbohydrates. Sodium is a natural element found in all foodstuffs. Meat, fish, milk and eggs contain more sodium than fruits, cereals and vegetables mayor. Sodium is a constituent in salt (sodium chloride) are commonly used for cooking and the kitchen table is provided as a flavor enhancer. Sodium is also a component of several food flavoring and additives such as spices (monosodium glutamate), baking soda (sodium bicarbonate). This element is also present in the food preservatives such as sodium benzoate and sodium sulphite (saltpeter). The content of sodium in the diet increased with the application of various preservation method such as adding salt in the manufacture of fish sauce, dried shrimp, ham, tongue and smoked cheese. Similarly, fruits and pickled vegetables, pickles and vegetables stored in bottles or cans, various types such as taoco sauce, ketchup, chili sauce and others. Breads and cakes that are developed with baking soda or sodium bicarbonate also increase sodium intake for those who have the habit of eating bread or cake as a snack. In most cases, a moderate degree of restriction as illustrated by the examples outlined below low-salt diet is sufficient. This diet can be used to cope with primary hypertension, particularly mild hypertension. In some people, hypertension occur together with high salt intake. Most of the preparations will encourage the excretion of potassium diuretic in addition to sodium excretion. To prevent depletion klasium during treatment with diuretic preparations necessary element supplementation.